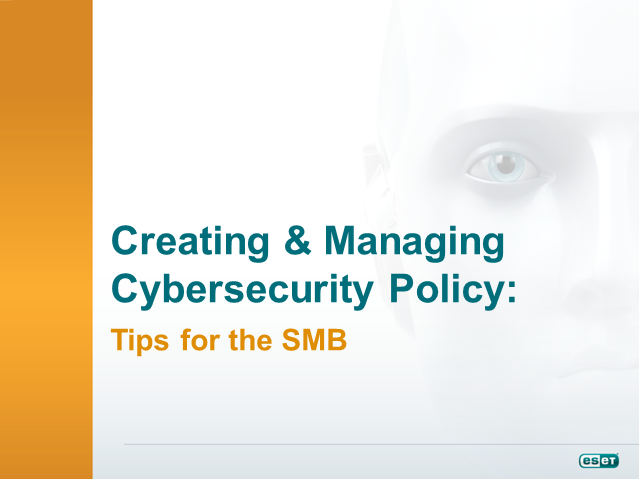 Many small and medium-size businesses (SMB) operate under the mistaken impression that their size, or the minimal security steps that they have already taken, will protect them from cyber attacks. What areas of security risks concern you the most? What possible damages from a cybercrime attack keep you up at night? What are the most important aspects of endpoint security? Learn what concerns IT managers have when it comes to the security of your business and how to get a peace of mind by getting the right security solution for you. Join Savitz Research Insights Team as they present their findings on the latest cybersecurity issues facing the SMB IT Manager. Learn how ESET’s next generation of endpoint security products make protecting and controlling your business systems easier and more cost-effective. Built using the award-winning ESET NOD32® technology. ESET Endpoint Antivirus and ESET Endpoint Security aren’t just updates to existing products, but entirely new ways of approaching your endpoint security. If you are like most small businesses you have probably experienced issues with anti-malware software in the past. Do any of the issues below ring true when thinking about your current antivirus solution? If so, join Peter Streips, Network Security Group (ESET’s Gold Partner) President and ESET researchers for a panel discussion and learn why it’s time to change your antivirus solution. Third-party tests can be extremely caluable for evaluating anti-malware products. In-fact, more tests are available than most people realize, covering not only detection rates and scanning speeds, but also factors like number of false positives and ability to block zero-day attacks. But an educated evaluator can both avoid the snares of misleading tests and find a surprising number of useful third party tests. Targeting of corporate and consumer data and devices by criminals and rogue states is well-funded and likely to persist for some time. Hardened operating systems, firewalls, IDS, and secure application coding are leading attackers to target endpoints, defined as people with devices, not devices alone. Analyzing large amounts of endpoint data we map current and emerging threats, both digital and analog, to provide a set of best practices for defeating attackers. How can IT security adapt to fight constantly mutating cyber threats? As the adversarial relationship between information security professionals and malicious cyberactors intensifies, the security gap between new attack methods and traditional controls will grow in favor of the attackers. Cyberattacks have become multidimensional in their complexity and sophistication. More specifically, we will dive into strategies to build a solid layered defense, not just patch-work products. For example, going from firewalls and IDS to log management, building DLP capabilities in your network, and investing in strong host-based controls would help you raise the bar significantly and give you advanced capabilities to identify malicious behaviors before they wreak havoc. - What sort of new threats (or increase of existing threats) can be expected in 2012? - What role does the commoditization of IT have, if any, in those threats? - What role does the social media have, if any, in those threats? - What can IT departments do to reduce their threat surface profile? With the deluge of new mobile smartphones like Android, iPhone, and others hitting the streets, there are thousands of new attack vectors against a company's IT infrastructure that create potential security nightmares. When users download apps by the droves and then want to connect to core critical infrastructure, how should IT handle it? While there is a drive for increased off-hours and/or offsite productivity using mobiles, can we stomach the changes that are coming, and can our organizations remain (or become) secure? Before you choose an antivirus solution it is important to understand how it goes about detecting malware in the first place. In a recent speech at the Massachusetts Institute of Technology (MIT), Department of Homeland Security (DHS), Secretary Janet Napolitano asked the question, âHow do we secure our nation's critical infrastructure when the vast majority of it is in private hands?â Itâs precisely why DHS is partnering with agencies such as the Commerce Departmentâs National Institute of Standards and Technology (NIST), and with private-sector companies in key areas such as finance, energy, transportation and others. But the real challenge will be to help our small and midsize businesses improve security, which often lack the resources and experience to protect themselves against today's slick, savvy cybercriminals. When it comes to being a victim of cybercrime, size does matter: âThe sting of a cybercrime is not felt equally across the board. A small company may NOT be able to survive even one significant cyberattack.â This chilling testimony to the extreme vulnerability of small and midsize businesses was delivered to the Senate Judiciary Committeeâs Subcommittee on Crime and Terrorism this spring by the FBIâs Cyber Division Assistant Director Gordon M. Snow. The implications to your business are clear. The question is, what can you do about it? NOTE: The first 50 live attendees will receive a free PDF copy of speaker Glenn Jacobs new book, Is Your Computer Bugged â Protecting Your Computer from Cyber Attack. - You can to defend your company – and its employees, partners and customers – against online attacks. Cybercrooks have changed the game. Lone hackers craving attention have been replaced by international criminal networks with vast resources and patience, and to them, your small business looks like easy prey. But there’s also some good news: Securing your small business is a lot easier than you thought. Join our panel of experts, including Naresh Lachmandas, CIO, General Atomics, as the panel discusses the changing nature of today’s cyberthreats, how to identify your business potential for attack, and the simple steps you can take to protect your organization from electronic intruders. As part of the Threat Management Summit ESET along with Frost & Sullivan will discuss Real-time Threat Detection. The headline grabbing attacks against firms like RSA, Epsilon, Lockheed Martin, and others have brought a great deal of attention to data protection and tools to protect the data itself. As many organizations look at moving data and services to the cloud, organizations are focusing their energies on securing cloud based services. Unfortunately, focus on the endpoint seems to be waning, leaving a large hole in many organization's defense. Rob Ayoub, CISSP and Research Director for Frost & Sullivan's Information Security Practice will discuss why protecting the endpoint is still critical in today's changing threat landscape. The endpoint is still the last connection to the end user and without adequate protections against the latest threats, corporate data is still at risk, even with safeguards in place. With the pace of emerging threats, it’s not good enough to know about the last attack to hit your company, you have to be prepared for the next, with always-on, self-learning, adaptive technology leading your security stance. Get the information you need to make the right decision through this presentation followed by a 30 minute panel available for your questions about ESET products, services and solutions. >> Effectiveness/Coverage: What threats does the solution eliminate? Does the solution address the immediate concerns of zero-day attacks while maintaining a legacy database to avoid the re-introduction of known viruses? >> Performance: Does the solution consume resources that impact your users in order to meet fast scanning requirements or operate in the background to minimize the impact on your users. Is the scanning configurable to achieve a balance between speed and security? >> Environmental fit and usage: How well does the anti-virus utility conform to the platform, operating system and application environment that you have created for your organization? The proliferation of multiple type’s of devices across businesses offers many benefits; desktop computers running both Windows or Mac OSX, tablets and mobile phones. The advantages and productivity are obvious. What is not so obvious, till it is too late, is how to protect your business from malware attacks? – When trying to find a product to protect multiple platforms - Does product certification matter? Join us to examine some of the malware risks associated with heterogeneous computing environments and solutions to protect your valuable business assets. Not long ago there were those who were complaining that there was a monoculture in computing. Too many people were using Windows operating systems and that was a primary facilitator for Windows based attacks. Over the past few years things have been changing. Endpoints now, are likely to be mobile devices using various operating systems, to reside on a server in the cloud by way of desktop virtualization, or to be a non-Windows machine running Apple or Linux. • Centralized management with remote administration that verifies protection, is used for compliance reporting, and saves IT resources. • High level of performance. This includes a small footprint and fast scanning so as to not negatively impact on machine performance, while at the same time maintaining a high level of protection. Trends such as mobility, Web 2.0, and consumerization are shattering traditional notions of IT control. As a result, IT security organizations are struggling to defend against a more formidable hacker adversary at a time when they have less visibility and control over their IT environment. ESET: The New Threatscape - What hasn't changed? What is the Cybersecurity Masters Series? Threats are evolving by the second. It's no longer just about viruses. Spyware, trojans, worms, rootkits, bots and phishing attacks are all on the rise. Malware writers are constantly reworking their code to evade security defenses. The ESET Channel features resources to understand the nature of these evolving threats, their impact on your business, and why proactive protection is so important.